Most of us experience acne to some extent during our lives. It is estimated that at least 90% of people will have acne at some stage in their lives. Of course, it is the severity and persistence of acne that differentiates its impact on the lives of both teenagers and adults. People variously use the term acne to describe a range of complexion problems including pimples, small spots, large fiery spots, blackheads, and other lumps and bumps usually on the face, but also commonly on the back, chest, shoulders and neck. There are medical grades of acne and for many people the severity is no more than the milder grades 1 and 2 and it is simply a short-term annoyance. However, for others it is a life affecting condition that can be long term with both physical and emotional repercussions including damage to self esteem and an inhibitor to social interaction. It can cause depression – severe and mild. Although acne is most often associated with teenagers it is on the increase in adults and many adults find that their skin can develop acneic symptoms later on in life even if they weren’t present when they were younger. Whether acne is mild or severe, if it affects the emotional well being of anyone, help should be sought. Traditional treatments have a variety of side effects and sometimes require months to work, if they work at all. Topical creams and lotions have been known to cause redness and irritation. Oral antibiotics can cause stomach upset, light sensitivity and yeast infections in women, and recent studies indicate about 40% of skin bacteria have become resistant to antibiotics, making them a doubtful ally in the fight against skin breakouts. In the UK millions of pounds are spent on acne treatments and medications each year. In many instances, the money spent yields less than satisfactory results. 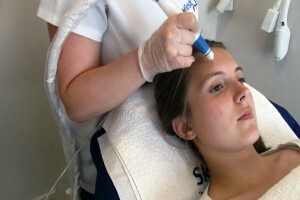 Medical practitioners are becoming increasingly supportive of the benefits of Intense Pulsed Light and advances on that technology (such as the combined technology of Multi Pulsed Light known as MPL, used by SkinFirst) to successfully treat acne and other skin conditions without adverse side effects. At SkinFirst we do get remarkable results for our acne clients. This is partly because we are one of the few clinics which can target exactly the optimum depth (420nm) to the bacteria that is responsible for acne. Other practitioners frequently use a wavelength that doubles up for a number of different treatments (such as thread veins, pigmentation, skin rejuvenation and acne). But we at SkinFirst use completely different wavelengths for each of these conditions and that is one of the reasons why our results are so good. Our technology enables us to treat at the most appropriate settings for acne and other skin concerns. Without going into too much technical detail here, we have many features in our machines which assist further enhancement of treatment results (many more pulse and delay options than some popular machines) and of course, as always, the combination of radio frequency to boost the effects. Please see our technology section for an explanation but suffice it to say that we treat many clients for all grades of acne and we would welcome you to visit us to discuss your concerns no matter how mild or severe. The build up of bacteria. At the onset of the acne process, this glue-like substance causes a microscopic blockage consisting of compacted dead cells, called micro-comedones. At this stage the process is developing in the follicle only and the surface of the skin can appear entirely clear and unaffected. As the cells continue to stick together, oil begins to get trapped within the follicle; the oil is ‘consumed’ by bacteria called Propiono-bacterium acnes (known commonly as the p.acnes bacteria) which then excretes an inflammatory fatty acid by-product. Eventually, usually after several weeks to months, the follicle becomes completely blocked. It is at this stage that various acne lesions may begin to surface. Using MPL® technology, carefully targeted to the wavelength and at the settings most relevant to the location of the bacteria, light energy destroys the acne.p bacteria quickly and easily and causes a shrinkage of the inflamed sebaceous glands that cause outbreaks of pustules. At the same time the light and radio frequency energy gently heats the skin around the spots, activating the cells in the skin called fibroblasts which stimulate collagen remodelling and new collagen production that boosts the healing process causing the spots to disappear. Because the SkinFirst machines have the additional element of radio frequency and because they also target a more specific wavelength than most other machines, we are particularly well positioned to ensure the optimum results for our clients. The treatment is non-invasive so there is NO recovery period after treatment. Normal activities may resume immediately after the acne treatment. Depending on the severity of the acne further treatments may be required and a maintenance programme employed to control the activity of the sebaceous glands and the bacteria responsible for causing the acne. Homecare is also important. Once we have taken control of the bacteria and improved the skin condition visibly and within the lower levels of the skin, we need to ensure that the conditions which aided the onset of the spots and lesions is not re-created. As mentioned, acne sufferers often have an irregular shedding of dead skin cells and some of the cosmeceutical products we recommend can help to control this. Likewise, acne sufferers often feel that due to the excess oil they have on their skin, they should be drying the skin out and they use astringents that are wholly inappropriate and which, in fact, exacerbate the problem. These drying agents result in the brain receiving messages to produce more oil and the vicious circle continues! In reality they should be hydrating their skin at a deep level (which is different to moisturising the skin. Moisturising simply increases the surface lipidity). We have excellent product ranges for all grades and severity of acne. We also have products for mature skins with acne who are looking to combat lines and wrinkles too. Depending on the skin condition and client (including presence of scarring and pustules or not) then we would also perhaps recommend peels and water and oxygen treatments, but as a first step a free consultation would be advisable, so please do contact your local SkinFirst clinic. SkinFirst recommend combining the MPL® and radio frequency treatments with a good skin care regime to promote healthier, softer and more radiant skin.. For best results, we would suggest having a treatment once a week for four weeks or in some cases once every 2 weeks depending on your skin’s condition. Clients usually see significant improvement after 4 to 6 treatments. The skin should continue to improve after the course of treatments have finished. Following this, it is envisaged that further maintenance treatments may be required at six monthly intervals. IPL (or the more advanced MPL® that we use) can cause some slight brief pinprick sensations. In certain cases there may be redness in the treated area, local oedema (swelling) or peri-follicular papullae (goose bumps). These effects will disappear several hours after the treatment. However in the majority of cases there are no visible secondary effects. Girls and women often disguise their acne with make up, so please do wear make up to any facial and for treatments if this makes you feel more comfortable. We will cleanse the skin and make up can be reapplied afterwards. If treating the face we will always offer a high quality mineral make-up so that you leave the clinic feeling as confident as you did when you first came in, or you can put your own make up back on. For men we apply a cooling cosmeceutical product to relieve these side effects, and we also have tinted SPF to protect the skin and help disguise acne for men and boys if they like us to apply this until the condition improves. We treat many people, young and old, with acne, and we offer privacy and discretion, so please do not be worried about your skin concerns, as we are here to help improve that condition, which is very common.